Many consumers have struggled with the decision to hire a snow removal company for the season or do it themselves. They worry about the cost and also health issues, particularly during heavy snow days when shoveling can be very strenuous. Now there is a third solution provided by TouchPlow, no contract driveway snow clearing. Modeled after the ride sharing service, Uber, TouchPlow allows consumers to order snow removal on demand. This is another example of how technology is delivering better service and more competition to the consumer. When there is a light snowfall clear the snow from the driveway yourself. After a heavy snowfall use TouchPlow to order a contractor to come within a specified time frame. The breakeven cost is somewhere between 10 and 15 times. Cost for a double wide driveway large enough for 4 cars will cost between $30 and $45 depending on how quickly you need the service. You can save on the cost by only ordering on heavy snowfall days and giving the contractor 24 hours to complete the job. Prices may vary based on demand and supply of contractors. Once you place your order, a snow removal contractor will bid on the job and make arrangements to clear the snow from your driveway. No Contract Driveway Snow Clearing is a new solution which may have some growing pains. Download the app to your smartphone and sign up for the service to get started. There is a new snow clearing service available that is modeled after the Uber ride sharing system. On Demand Driveway Snow Removal provided by local contractors. 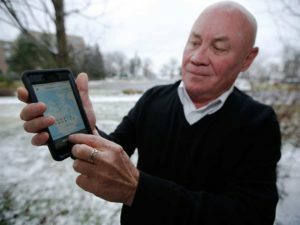 It is called TouchPlow and is designed for consumers to order snow clearing as needed using an app on their smart phones. The app is available on both apple and android phones. All you need to do is download the Touch plow driveway snow removal service. Once you install the app, you will need to create an account, providing address and payment information. Whenever you need your driveway cleared of snow, just place an order and wait for a bid. There are a couple of things that consumers need to be aware of when using this app and the services provided by contractors. We will cover a few of them in this article, although the services in still quite new. They are still getting the bugs out of the system. From a process perspective it all seems to work really well. Once you create an account, select your driveway size, place an order and wait for a contractor to take your request. You can request service in 4 hours, or longer. The longer your willing to wait, the lower the price that you will pay. Something to consider based on how urgently you need your driveway cleared. Any contractor can pick up your order. There have been some reports of less than scrupulous contractors taking bids. This is part of the getting established phase. You will want to monitor how good a job the contractor does. Some folks have placed their order while sitting in Florida for their home in Ottawa. Nice touch and you do not need to be there to clear snow. You can also specify if you just need the driveway clear or if you also want your steps and sidewalks cleared. It all depends on the price you want to pay. The trade off of course is relying on a contractor to meet specific standards throughout the winter or just ordering snow clearing as you need it. Prices we saw indicated $30 to $40 for Touchplow driveway snow removal. A seasonal contract could cost around $500, making it worth about 10 driveway clearings in the season. If you get a lot of snow days, you might lose out going with Touchplow vs. a seasonal contract. A decision consumers need to make.